Maybe you have forgotten the last time that you went into an abscessed appendicitis, only to see what looks like the aftermath of an IED explosion. Seriously, I have operated on some horrific appendiceal abscesses, and ended up needing to perform a right hemicolectomy. That is the whole point of drain with interval appendectomy. But figuring out which patient is OK to push forward with an operation and which to drain is not as simple as no abscess or abscess respectively - as you have pointed out. I can't imagine patients or family wanting it any other way. Not that I have seen 80 billion appys (as you have, I am sure), but I have never seen a JP drain placed for one, even if it was perforated. I'm not sure why, especially since there's not that much morbidity attached to popping one in, and there's a lot of benefit to keeping a drain ready to go should pus build up. 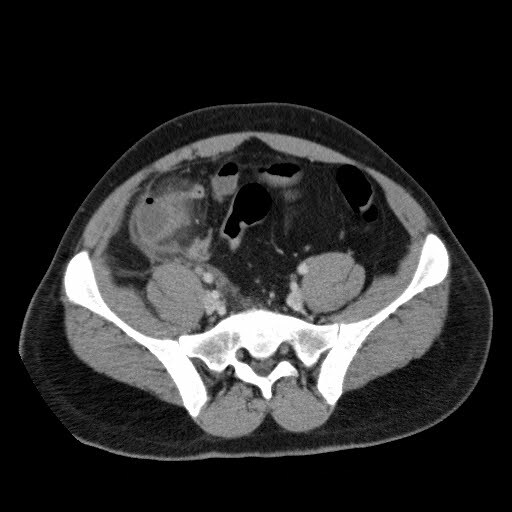 I wonder who, in sound mind, would do a CT-guided drainage of that abscess. Get the damn appendix out first. Great post. I absolutely agree! I mean besides covering the Interventional Radiologist's Boat Payment..
"Just put a 50 French Chest Tube in!!!!" I seathed silently. That is big enough, isn't it? just one thing. i too have seen some pretty horrific appendixes and i just can't imagine needing to do a right hemi. so i suppose that means i agree with buckeye. Spoken like a True Flea. Amen from an old county brother. If the appendix still exists even with that abscess, wash it out and take it out. I've also not found interval appys to be that gratifying or even necessary if the exploded 'pendix is no longer visible on f/u CT if you've gone that route. What do you do with the stump in an abscess like this? The caecum's probably completely inflamed... will it take an endoloop? My 11 year son is currently suffering from this. His drain has been in for over 7 weeks now..still has appendix in. Perforated bowel as well. I'm freaking out! Do I need second opinion...when will the appendix come out! I have insurance. Comment from over the pond - CT guided drainage? Has it's place, but in a very few, well selected patients. Remove the source of infection, wash out leave a drain - so what buckeye said! Well - I left comment on Oct. 15. My son's appendix finally removed Oct. 24 (emergency) but huge abdominal abscess now formed shortly after surgery and his drain was already removed (Oct 27). New drain in front of my son's body now (placed in Nov. 6) for this new abscess (blood clot). Week 13 of appendix nightmare...(all started Sept. 8). No doubt this case will be in (Cdn) medical books. 8 sonograms+ and 2 CT scans later and numerous medications....he's 11 yrs old.. I see a lot of opinions...but there is data on this topic. There is a 3X higher rate of complications from attempted appy vs. drain and interval appy.